5) Thats it. You should be running the Contacts demo. You don't need an Activator. 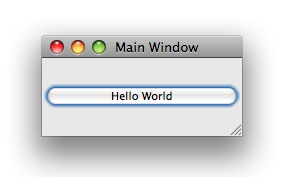 In the Overview tab, remove the Activator class and also delete the Activator.java file from the sources. Now, we have the view, lets create an RCP product that will use this view. Fire up the New Wizard and create a Product Configuration file with the basic settings. In the Product Configuration editor, give it some name and click the New for the Product. Specify some id and select 'org.eclipse.e4.ui.workbench.swt.application' for Application. You are all set to go. Switch to the Dependencies tab of the Product Editor and add your plugin. Click 'Add Required plugins' and launch. The launch will fail, because we have not included few more plugins that are required, but not specified in the dependencies (from databinding beans to renderers will be missing) The simplest way to get thru the error, is to edit the launch configuration and launch with 'all workspace and enabled target plugins'. Now launch again, voila - there comes your first e4 RCP!